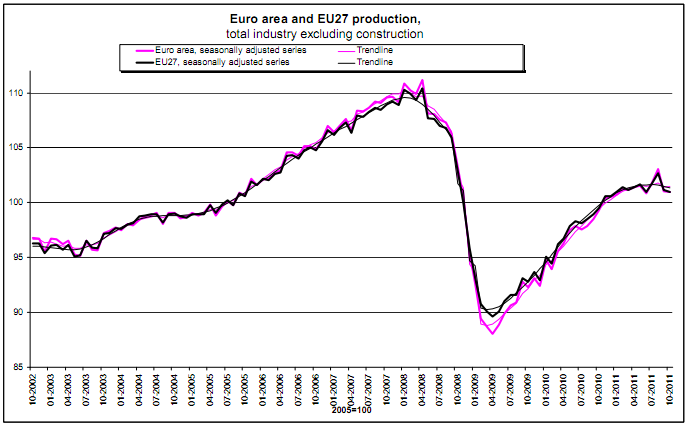 The latest data are above - European industrial production has been slowing all year and now appears to be dropping. Given the sharp drop in new orders in September this is perhaps not surprising and is also consistent with the declining retail trade and increasing unemployment in Europe. The policy elite in Europe seems to be completely fixated on reducing government spending, which can only slow the economy more in the short term, further weakening the banks and weak government finances. 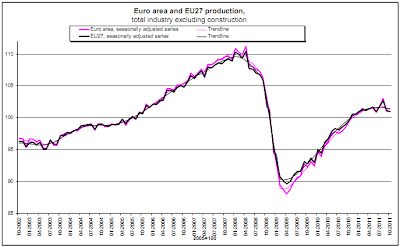 Thus it continues to seem that Europe has to get quite a bit worse before it can get better. At this point I have a poor sense of where the bottom might be - does the ECB ultimately come to its senses and prevent default by more governments than just Greece? Or do we end up in a cycle of more credit downgrades, outright default by Italy, Portugal, and significant numbers of the highly leveraged European banks? In the latter scenario, I think the final consequences get extremely hard to see but it has to get very ugly and Europe might not ever be the same again. In other news - Eurozone inflation stayed at the stubbornly high level of 3% in November. This is not your Grandfather's depression - in the thirties lack of aggregate demand (due to a previous debt-levered bubble in the twenties) combined with fundamentally plentiful resources to give rise to deflation at the same time that economic output was contracting. Here we have the same post-bubble lack of aggregate demand (relative to productive capacity), but it combines with important natural resource constraints to keep inflation moderate despite economic weakness. The principal resource constraints are oil, and that has created food constraints also (as policy elites rather foolishly decided to try and solve the oil problem by converting food to fuel). There are also secondary constraints in some industrial metals (some more short-term, others - copper perhaps - probably permanent). This I think creates a certain zero-sum quality to the global economy at the moment that has not obtained for most of the last two centuries. If your economy contracts and your consumption of the key resources drops, others will expand to take up that resource usage and you may not be able to get back to that level of resource usage anytime soon - instead having to learn to get by on less of it. Seems like new solar breakthrough came to the rescue! "The policy elite in Europe seems to be completely fixated on reducing government spending, which can only slow the economy more in the short term, further weakening the banks and weak government finances." "as policy elites rather foolishly decided to try and solve the oil problem by converting food to fuel"
Well, regardless, it's still all for the best in the best of all possible political systems.